What is PetSafe Outdoor Bark Control Birdhouse? The PetSafe Outdoor Bark Control Birdhouse stops unwanted barking by your dog or neighboring dogs. The unit automatically detects barking and emits an unpleasant, yet safe ultrasonic sound to stop excessive barking. 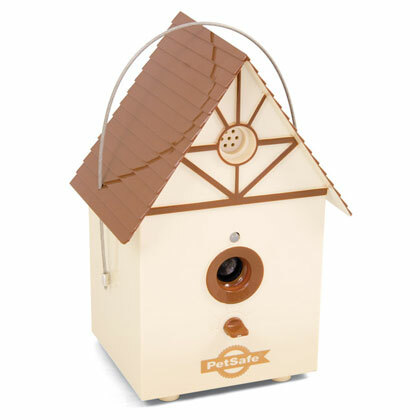 The unit is housed in an attractive, weatherproof birdhouse shape and has a range of 3 settings. The unit contains a two-color LED battery life indicator. One 9-volt alkaline battery is needed for operation (not included). The PetSafe Outdoor Bark Control Birdhouse contains an internal microphone that automatically detects dog barking. The unit emits a safe, high pitched ultrasonic sound detectable only to dogs. The dog will learn to stop barking to avoid the unpleasant sound. For use outdoors only. Keep unit at arm's length from human ears. Humans should not stand too close to the device while testing. It is recommended to begin training at the lowest sensitivity. Gradually increase intensity if your dog does not respond. For in-depth installation details, please read the PetSafe Outdoor Bark Control Birdhouse manual. The unit should be placed outside within range of your dog (50 ft. max). The unit can be hung or mounted and should be positioned no higher than 5 feet. The unit can stand alone, be placed in a tree, hang from a pole, on a fence post, etc. For best results, the area between the unit and the dog should be clear and free of obstacles. Begin use of unit on low sensitivity (15 feet range) and only increase to medium sensitivity (30 feet range) if the dog does not respond. Increase to high sensitivity (50 feet range) if your dog does not respond to medium sensitivity. Test unit to verify it is working properly. Inserting and removing battery: The unit uses a replaceable 9-volt battery (not included). The battery door is located on the back of the unit. Pull battery door open and insert the 9-volt battery with the positive side to the right. Replace the battery door by positioning the top edge first, and snap the bottom of battery door into place. Average battery life is 2 months, depending on how often the dog barks. To conserve battery life, turn to the OFF position when the unit is not in use. The LED indicator displays good/low battery life. Good battery equals 1 green flash every 5 seconds. Low battery equals 3 red flashes every 5 seconds. No light indicates it is time to replace the battery. The red light is solid when emitting the ultrasonic sound. When in test mode, the red light will flash if battery is low. Testing the unit: Turn the mode switch to TEST. Hold the unit with the indicator light facing towards you. The unit should be arm's length away from your mouth. In order to trigger the unit, make a loud "woof" sound toward the microphone. The LED light will flash red and there will be an audible sound to indicate that it is functioning properly. If the indicator light does not flash and there is no audible sound, ensure that the battery is properly installed and/or replace the battery. Return the mode switch to low sensitivity before using the unit.Note: The test mode is not intended for normal operation. If the unit is left in test mode, it can send false signals and may reduce battery life. The unit is weatherproof, however, if water enters the microphone it may disrupt the unit's operation. The microphone will work properly once dry.